Treasury Casino in Brisbane is one of the major tourist attractions in Brisbane. 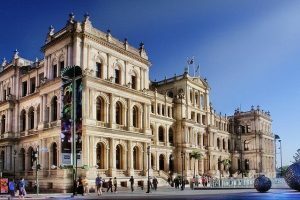 The Treasury Casino, is the only casino in Brisbane at the moment, however, a new casino is coming up soon in Brisbane. Casino is visited by thousands of visitors and locals for gambling games, food, events and variety of entertainment. If you are making a list of things to do in Brisbane city, then this casino should definitely make it to your list. Treasury casino is only a few steps away from Queen street mall, situated at the corner of George street and Elizabeth street, Brisbane city. It is surrounded by all the tourist hot spots in Brisbane, so it is worth making a visit to this spot as you can cover all the other tourist spots in Brisbane city while you are here. You can easily catch a train from anywhere in Brisbane to central station in Brisbane city and walk to the casino from the central stations. Parking in the city is a bit tough to find but you can park in the casino’s 700 vehicle car park. Treasury casino offers a variety of gambling games including Treasury Wheel (Australian Big Six wheel), Blackjack, mini Baccarat (card game), Treasury 21 (a variant of Spanish 21), Caribbean Stud Poker, roulette, craps, 3-card and of course Poker and slot machines. Treasury casino also houses a hotel, five restaurants, seven bars, and a nightclub. Live entertainment is a major attraction of this place. The casino nighclub hosts live performances by the local bands and other musical shows, which makes this place as one of the most favourite places to visit on weekends. There is also a new mega casino and resort proposed for Brisbane’s CBD which is set to begin in 2017 and expected to complete in five years. The construction of the new casino will generate around 3000 jobs, and 8000 permanent jobs upon its completion. It is going to be a big addition to Brisbane’s lifestlye. It is predicted that Queensland will see an influx of 1.39 million additional tourists each year and the growing casino scene in Brisbane will play a major role in Queensland’s tourism industry.